I'm not sure what can be said about the original Cave Story at this point that hasn't been echoed elsewhere about a billion times over. The original freeware PC game is phenomenal, a labor of love many years in production by its sole creator, Daisuke Amaya. It's only recently, however, that this talented man has seen any sort of monetary reward for his wonderful creation: first with ports on WiiWare and the Nintendo DSi shop, and now with a considerably more ambitious remake with full-on 3D visuals. For those who might have been living in a cave (HA! I kill me!) and haven't heard of Cave Story before, the game is a 2D action/exploration-based title inspired by games like Metroid. Through the course of the game, you'll explore a mysterious island filled with secrets, enemies, puzzles, and adorable rabbit people with a terrible secret. It's a title known for its incredibly clever and fun design: hidden goodies are littered about just waiting to be found with some exploration, multiple weapons (all very useful) can be collected and upgraded, enemies and traps challenge you with deft shots and tricky jumps, and fearsome bosses put your platforming skills to the test. There's a story that unfolds across the course of the game, too , and despite the relatively cute visuals, Cave Story's plot is surprisingly dark and melancholy. It all adds up to a uniquely charming and interesting game that's won the hearts of many players worldwide. So what's Cave Story 3D about, then? At its core, it's a recreation of the original, sprite-based 2D title with polygonal visuals and 3D depth. The gameplay is still the 2D sidescrolling platform action/adventure we've all come to love, and it makes the transition wonderfully. While the character models lack the appeal of the sprite designs they were based on, the backgrounds and environments look gorgeous, packed with lots of interesting little details that really help add to the atmosphere of the game. They're not perfect, though -- occasionally it can be tough to judge spacing and which platforms can be used as proper footing, and foreground objects tend to look awkward (particularly when layered against dialogue boxes). New visuals aren't the only addition here -- there's a superb remixed soundtrack accompanying the game, along with some new items (Prinny hat!) and a few fresh (and surprisingly lengthy) areas to explore. The game isn't too long, but the new additions do add some extra exploration and playtime (and it's really hard to argue that more Cave Story is a bad thing). There's a good deal of replayablity here, too, with multiple endings and difficulty settings, along with a final set of stages that will challenge even the most hardened action game veterans. 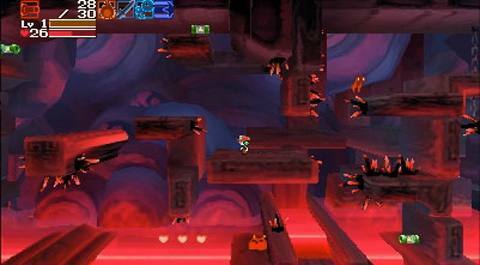 But this also highlights one of the weaknesses of Cave Story: some puzzles and secrets can be quite obtuse, and making even one mistake or missing one piece of a particular set of secrets once you hit a specific point in the game will completely lock you out of the final stages and best ending, necessitating a full replay. In other words, if you want the best ending, you'd better have GameFAQs open -- which, obviously, detracts from a lot of fun derived from exploration. Overall, though, it's hard to deny the fact that Cave Story is a fantastic game. The real question is this: Is it worth the $40 asking price for this new and improved version when various other editions cost far less? Personally, I'm all for giving Amaya and those helping to give his masterwork more recognition the compensation they have earned, but that's my personal set of values. If you haven't played Cave Story before and want to see what the fuss is about, or are a die-hard fan who needs to have it in every form possible, you simply can't go wrong with Cave Story 3D. But if you're even a little bit on the fence about the price-for-value ratio, you might just want to stick with the other versions for the time being. After all, Cave Story is a modern platforming classic no matter what shape it takes. This story, "Review: Cave Story 3D Is Compelling Despite Unsubstantial New Content" was originally published by GamePro. This exploration-based side-scroller shines on Nintendo's 3D handheld, even if it isn't as jam-packed with new content as one might hope.